Bethham-based rally driver David Wright had mixed fortunes on last weekend’s Woodpecker Stages rally when a series of problems meant he only finished fifth in class but the result was good enough for him to move into the lead of the class championship. The Ludlow-based event kicked off with the High Vinnalls stages. 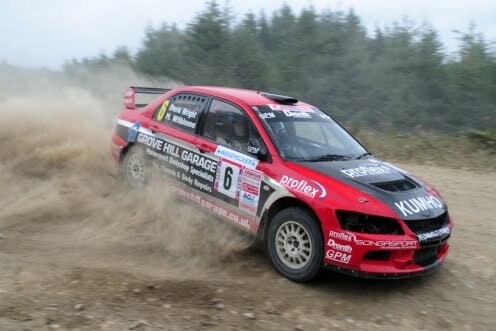 Wright was going well in his Kumho Tyres, Drenth, Proflex and Grove Hill Garage-supported GPM Mitsubishi Evo 9 but three miles from the end of the stage the engine started overheating forcing him to reduce his pace. Despite this he was still third fastest in the BTRDA B13 class. In the second stage, Hazel Coppice, Wright thought the engine was seizing and so stopped for 90 seconds. With the engine cooled sufficiently he got to the end of the stage and back to the service halt where a quick oil change was performed but the delay had dropped him to 69th place overall and 14th in class. The crews headed to Radnor for the Cwm y Gerwyn stage and Wright’s engine overheating troubles were over as he set the fastest time in his class. A different kind of problem was experienced in stage 4, Stanlow Tump, when Wright caught the competitor in front and was unable to get past because of dust which severely hampered visibility. With a clear run on the following Wigmore stage Wright was again fastest in his class, a feat he repeated on stage 6 to move up to seventh in class. A charge through the final Haye Park stage enabled Wright to move up to 14th overall and fifth in class by the rally finish. Wright now leads the B13 class championship with one round to go, the Cambrian rally in early October.